Want to take up cycling but don’t know where to begin? Try these top expert tips. They say you never forget how to ride a bike, but if you haven’t climbed into the saddle since childhood it’s a good idea to seek out some good advice and get the right equipment for you from the start. And this doesn’t necessarily mean having to spend a fortune. Find a local bike shop or cycling club and get some good advice based on experience and expertise from those in the know. It can be a bit daunting choosing a bike when there is so much choice and variety on offer. 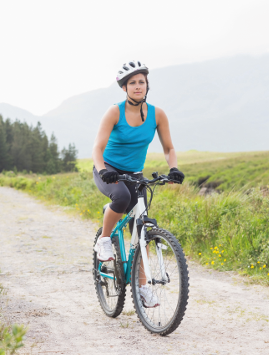 In order to narrow down the search a bit, you might want to consider having a bike fit. “This is approximately a two-hour session with a trained technician who will help to determine the optimum riding position for you to maximise comfort and performance and reduce risk of injury,” explains Morgan Lloyd, the physiotherapist and education manager with Cyclefit (www.cyclefit.co.uk). After finding out your aims and goals, sporting background, training and past injury history, the fitter will carry out a physical evaluation to determine your physical conditioning through a series of measurements and observations. Then, while you ride to a special bike-fitting jig, a series of further measurements is taken until the optimal position is determined. After the session you will receive a list of options of bikes that will suit your riding style and allow for the correct position to be achieved. The importance of wearing a helmet shouldn’t be underestimated. “They will save your life – they’ve saved mine twice!” says Mike Sanderson, bike buyer for GO Outdoors and the designer of GO Outdoors’ own brand of bikes, Callibre (www.gooutdoors.co.uk). “It’s not just to protect you from being knocked off – your fall could be caused by any number of reasons; adverse conditions, lack of skill or, most embarrassing of all, falling at the traffic lights as you struggle to get ‘unclipped’. It’s also essential to choose clothing that is visible to other road users. “Don’t underestimate how difficult it is sometimes for drivers to see a cyclist,” says Morgan. Padded shorts are another essential buy: “A good pair of cycling shorts worn without underwear coupled with the right saddle for you will mean more time in the saddle and less pain when you get back on the next time,” says Mike. “You don’t have to only wear the cycling shorts – baggy shorts or trousers can be worn over the top.” Lastly, make sure you purchase front and rear lights and consider using a rear light even in daylight hours.